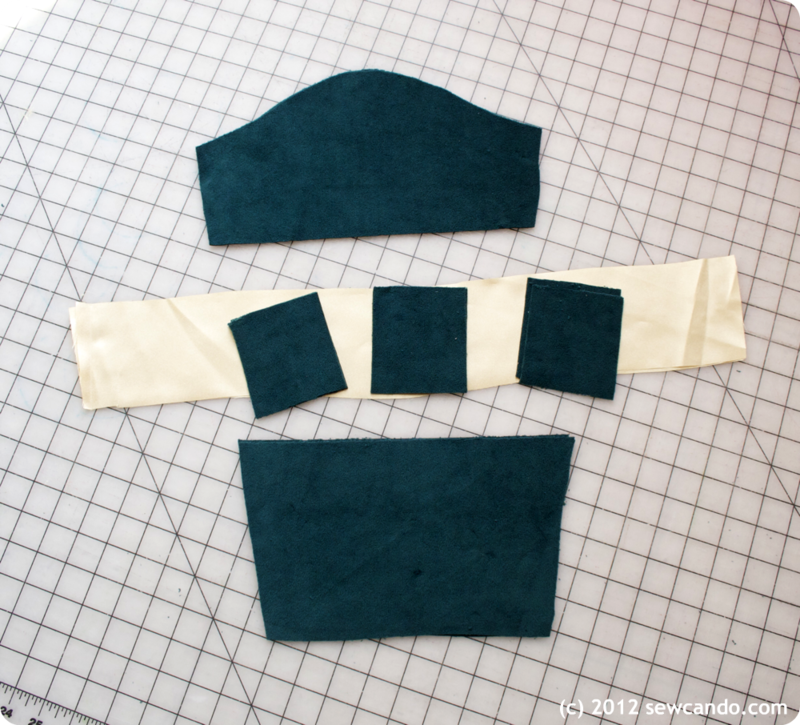 There was such a great response to my Princess Merida Costume the other day, I've put together a bit of a how-to for making it. Today I'm sharing how to make the dress and it's movie-style details. To get the most authentic look, I used a bluish-green velour and golden yellow satin fabrics. I drafted my own dress pattern, but you could use a basic long-sleeved A-line dress pattern as a "base" and just re-draft the neckline to have a "V" cut out, plus lengthen the hem to reach the ankles. Making a matching facing for the inside of the collar is important since this will hold the shape (and the satin neck ruffle). I did a zipper back closure so it would be easy to get on & off my 3 yr old, but snaps or buttons would work too. To get the dress started I stitched zipper onto back pieces and attached the back & front dress pieces at the shoulders. Then I basted stabilizer to the wrong side of each of the facing pieces & stitched together the front and back portions of facing at shoulders (Pic 1). With the right sides facing, I matched up the facing and top of neckline of the dress at shoulder seams and "V" and stitched along the collar edges and clipped around the curves (Pic 2). 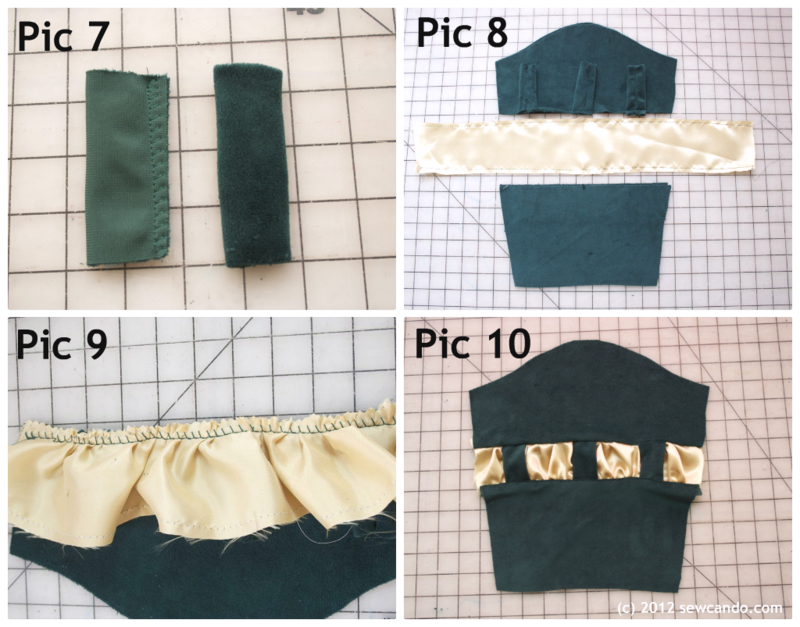 To create the golden ruffle behind the neckline, I cut pieces of satin that were 6 inches high and twice the width of the collar of the dress (one piece for the front, one for each of the back sides). 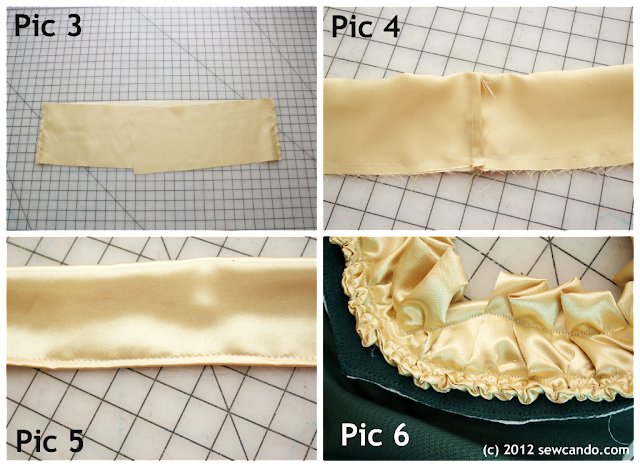 I stitched the short sides of the three satin collar pieces together with the front piece in the middle (Pic 3). Then folded the new long collar length-wise, with the right sides of the fabric facing inward and stitched along the raw edge (Pic 4). After turning the "tube" right side out, I basted along the newly made seam (Pic 5) and then pulled the threads to create the ruffle and pinned it onto the facing. (so the top of the ruffle was peeking out along the top of the dress about an inch and the seams of the ruffle and dress shoulders lined up) (Pic 6). 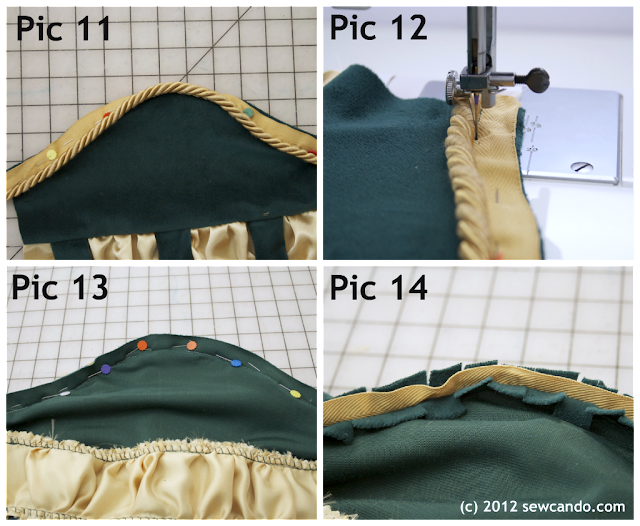 I stitched the bottom portion of the ruffle to the facing on the inside and then topstitched the satin to the top of the dress. I hand sewed some lacing along the "V" of the front using brown embroidery floss. After cutting the sleeves, I cut out a 3 inch high section out of the middle each sleeve and cut a 4 inch high strip from the satin that was twice as wide as portion I cut out. I then cut three elbow strap pieces that were 3 inches wide by 3.5 inches long. This will make the segmented elbow portion. After basting the width sides of the satin piece, I gathered it to fit the along the velour edges and sewed one side to the bottom of the top sleeve, the other to the upper portion of the lower sleeve (Pic 9). I also hemmed the bottom of the sleeve at this point (Pic 10). 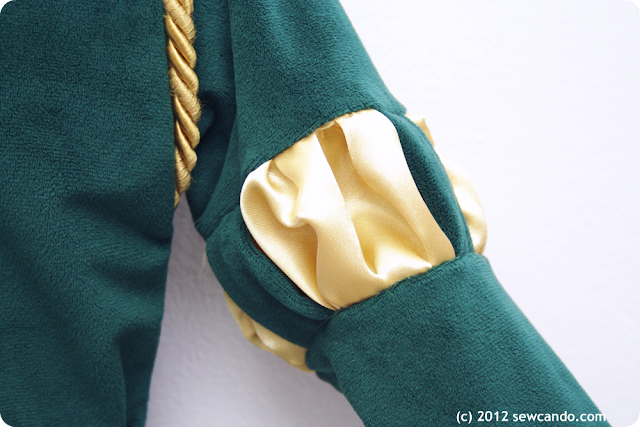 I pinned some golden home decor cording to the top of each sleeve (Pic 11) and then stitched together. My trick for getting my stitching really close to the cord edge was to remove my presser foot and sew very slowly (Pic 12). 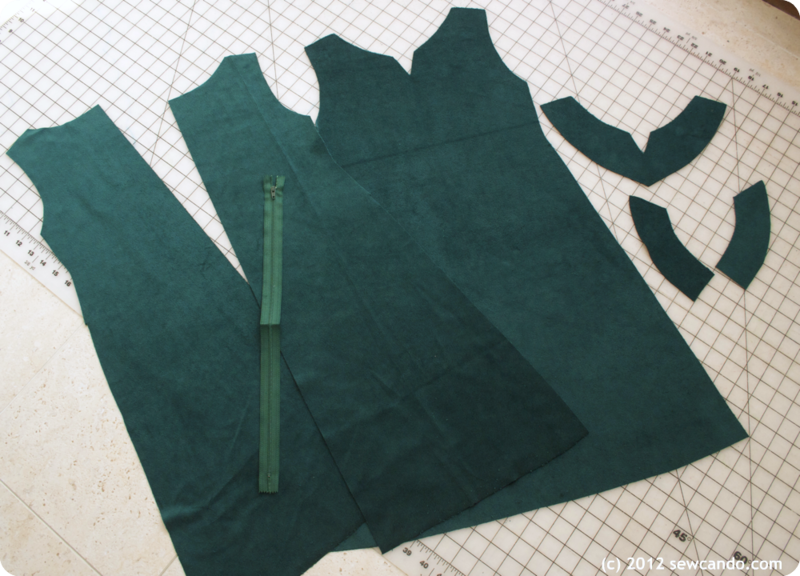 Next I pinned each sleeve to the shoulders of the dress, with the right sides facing and stitched together (Pic 13). I then clipped around the raw edge to add ease (Pic 14). The last steps were to sew up the sides from the edge of the sleeve and down the sides of the dress and turn right side out. To get the full Brave effect, you can find my tutorials for making the quiver belt and the Merida wig HERE! this is such an awesome costume... 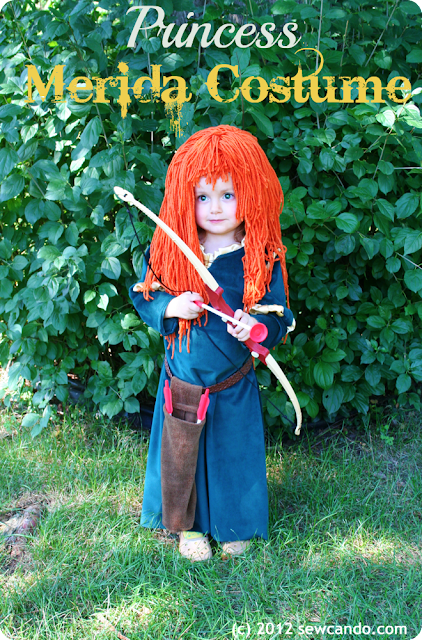 I saw Brave right after my baby girl was born (with red hair and blue eyes) -and bawled my eyes out ;op I'm hoping her hair will keep a red/auburn hue and she can be a Merida in a few years! Thanks Marci - it feels good to hear that! This is FABULOUS! I have so much love for this project! I loved the Brave film (currently listening to the soundtrack!) and think that this is a great costume! Thansk for sharing! Thanks Rebecca. We're such big fans of the movie too - glad to see we're not the only ones! This is so awesome! I am so disappointed with the Disney costumes could cry! You did a really great job! 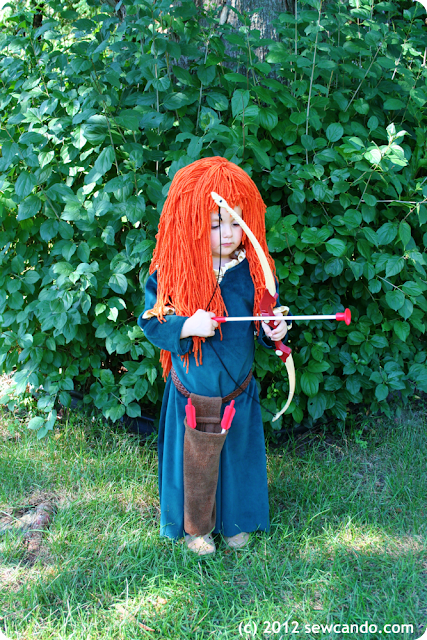 I am in the middle of sewing up my little Merida's dress as I write this. I hope mine comes out as good as yours!!!! I heart the yarn hair, what a great idea. My mom made me yarn pig tails the year I was Punky Brewster, I forgot how great that worked!! I am also trying to figure out how to give Husband a peg leg, since he has to be Merida's Dad. I get to be the Queen - I said that was cool as long as I don't have to wear a bear costume! Keep up the wonderful costume making!! Cheryl, I LOVE the costume!!!!! This has got to be the cutest costume ever! I don't know which is cuter-the costume or the model! Thanks so much Laura. She loves seeing herself dressed up in the pictures and with her digitally created "Merida blue eyes". LOVE THIS! Absolutely adorable! You did a great job on the costume and I just love the wig! Thanks for sharing at the Pomp Party! Hope to see you back next week! Totally awesome! I'll try to make this dress for my girl's birthday party and I'll follow your instructions, thank you very much! What a great idea. It makes me wish I had a little girl to make this for. I couldn't resist pinning you and sharing. Much appreciated Carla! It is fun to make girly things - even if I didn't have her I probably would have made one for myself! SO very cute! Love it all! Very creative! I hope you will share this on The CSI Project this week starting Wednesday night. The challenge is DIY Halloween Costumes. Come on over! You just might win!!! I definitely will - thanks for the invite! That is such an awesome costume! You put so much thought and detail into it, I bet your daughter loves it! Thanks so much Rachel and you're right - she loves wearing it, so that made all the work well worth it! Cheryl, this is just so very adorable a costume. 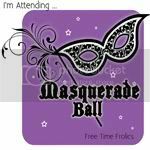 Thank you for sharing it on the blog in the linky 'Time for a Party'. btw. We'll have a new party tomorrow! Hope to seeing you again! Wow Cheryl, this costume is amazing! Thanks for showing it off on A Crafty Soiree, I've featured your project this week. Come see it when the post is up, at midnight EST on Thursday. Great tutorial for this lovely costume! this is just awesome, i cannot believe that there are peolpe like you that share this kind of beuatiful things so people like me (so far away from where u are) can learn how to do great stuff!!!. 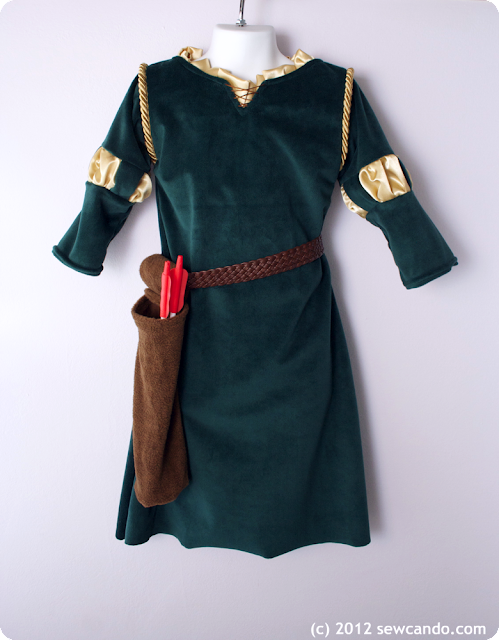 I´m gonna be cosplaying Merida for a medieval fair in México city, and your design will help me very much!! thanks a lot!! Thank you so much for the sweet comment! This really makes me proud and glad to share my ideas. I'm so happy this will help you and please send a picture when you make yours!! Do you have the pattern you made? My daughter is 16 months, but I'm sure I can adapt your pattern. I'm sorry, but I don't have something I can provide. 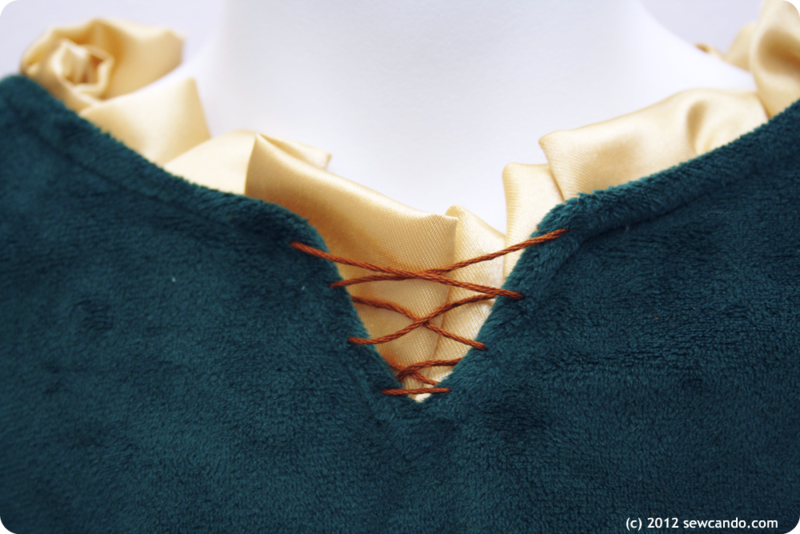 As mentioned in the post, you can use a standard A line dress pattern and follow my tutorial to make the Merida-style adaptations. Thank you so much for sharing your talents! None of the Brave costumes has been quite right for my daughter, I am pretty good at creating things, but this one, (mainly the sleeves) I was having a hard time wrapping my head around. But ones you laid it out, it looks so simple! Thank you so much for your creativity! That is wonderful to hear - I love when my tutorials help like that:) I'm a visual person and hate when I can't "see" how to do something. I try to provide them as much as I can, since I know I'm not alone! Thanks so much! I am happily sharing this on my Facebook Group page.... All credits given to you! An awesome outfit, Cheryl. Pinning for future reference. That's great to hear Janneke and thanks so much for sharing this - you did a great job!